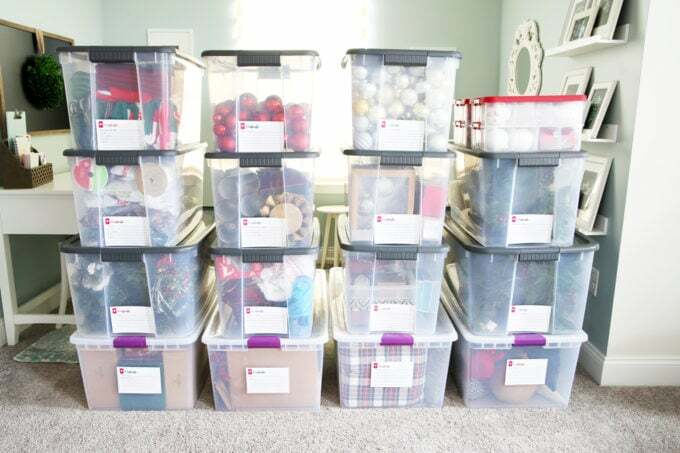 Time to organize storage bins full of Christmas and holiday decorations so they’re neat and tidy when you pull them out next year! 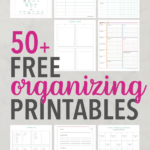 Grab the free printables below to help get organized! 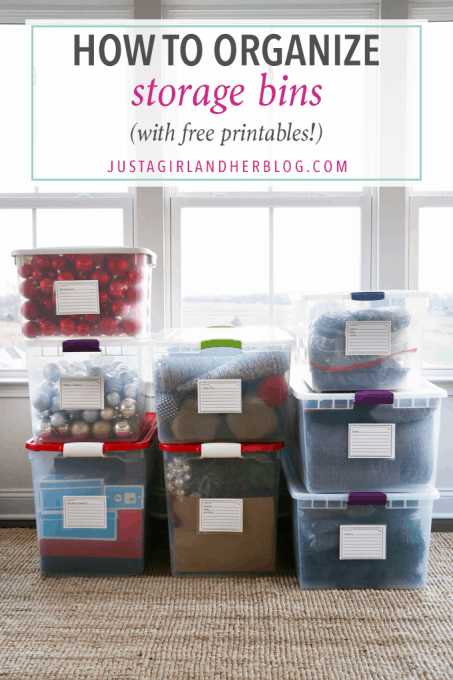 I’ve found that the more organized I am about putting my Christmas decorations away this year, the quicker and easier it will be to get them all out next year, so today I thought I’d give a quick rundown of how I organize storage bins to keep all of our holiday gear neat and tidy! I began by collecting allllll of my Christmas stuff from around the house and putting it in one spot. I emptied all the bins so I could easily see everything that was there. I always think it’s nice to start with a blank slate. Kind of crazy, right? And this was even before I had unpacked every single thing from the bins. Ugh! I love this part. 🙂 After everything has been set out, I start weeding out the things that are broken, missing pieces, out of date, or haven’t been used in a while, and I either throw those things away or put them in the donate or sell piles. It’s a waste of space to store things that I’m never going to use again! Once all of my junk is out of the way, I arrange everything into groups, putting like items together. This time I was doing my Christmas bins, so I put all of my ornaments in one section of the room, all of my mini trees in another spot, all of the ribbon in a separate pile, etc. I still wouldn’t call it organized per se, but we were getting there! Step 4- Match items with appropriate bins. 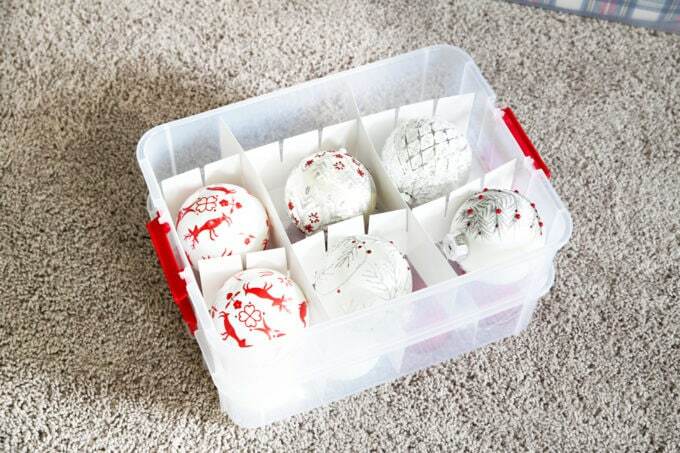 For ornaments, I sort the shatter resistant ornaments by color and put all of the metallic ornaments in one tub and all of the red ornaments in another tub. Just make sure you only do this with the plastic ones. Glass ones will break if you try to store them this way! For my fragile glass ornaments, I have little divided bins so each ornament can have its own slot. These bins are great, but they can get pricey, so I only use them for my really nice, really fragile ornaments. 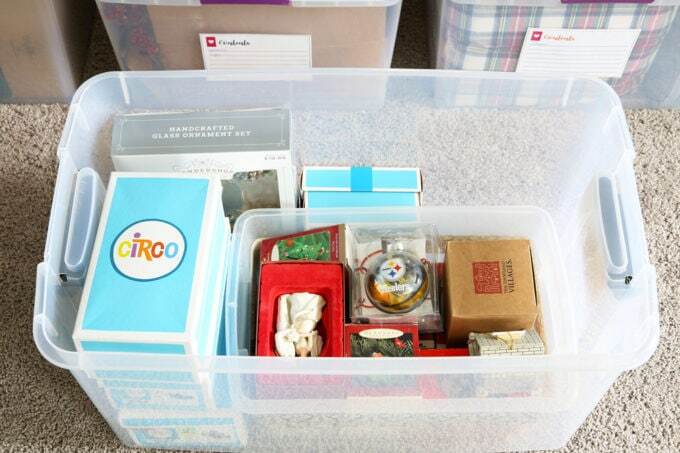 I just use shoe boxes to store our family ornaments within a larger bin. This lets me keep ornaments separated by type, and it’s FREE! My most favorite step ever! 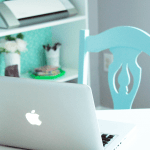 If you’re new to the blog, you’re finding out early– I’m slightly obsessed with labeling. I kind of can’t get enough of it. I printed out some cute tags on white card stock and wrote out the contents of each bin. 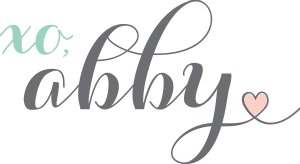 You can snag my cute tags too– just click on the photo below! 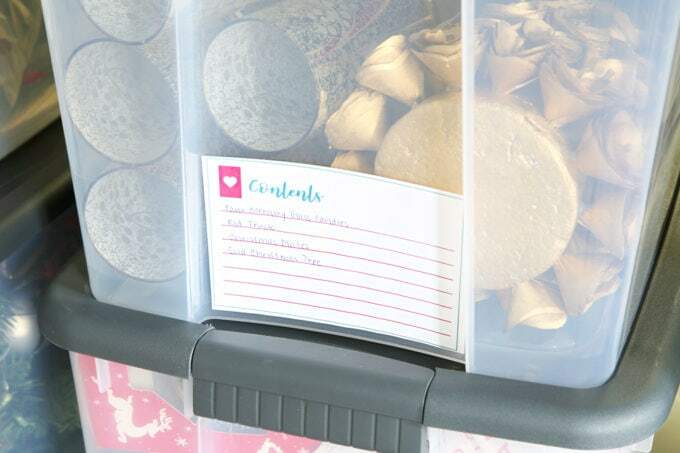 Click here to download free printable bin labels! I like to run my labels through my handy dandy laminator (I have one similar to this one and love it.) so they’re a little more sturdy. Then I just cut them apart and stick them to my bins. Boom. Organized. Now everything is neatly organized and ready to go back into storage, and I will be thanking myself next year because I’ll easily be able to find everything I need! Woohoo! 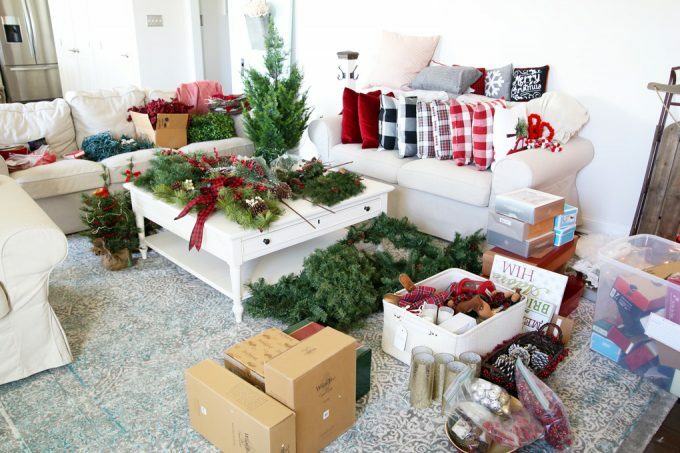 How do you keep all of your seasonal decor organized? I’d love to hear about your strategy in the comments below! 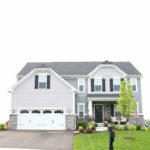 The photos below are from a previous version of this blog post. I love organising as well! I get so messy sometimes that organising becomes an obligation, but I learned to love it. Beautiful post! Yeah I was so excited to see the printables. I haven’t put our stuff away yet- these are perfect Abby:) Thanks for sharing!!! Perfect! Thank you Abby! Just what I needed! I was saying to my friend last week that I really need to go through all my storage bins and actually note down what is inside them – most a sentimental items (that I do need to purge) because trying to find that ONE thing is a MISSION!! So thank you for inspiring me to get it done! This is perfect timing and thanks for these labels. I will definitely use them, I’m gearing up for a craft room (which is really 1/2 of our storage area) makeover. It helps when moving things around to know what’s inside those bins. Is it strange that I want to get rid of my storage bins and buy ones that match? haha…again, thanks for the tips and for the link up! These bins and labels are awesome Abby- I love how you so clearly know what exactly is in each one! 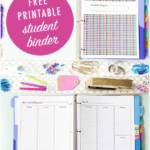 I bet your printables are going to be fabulous!! Great tips! 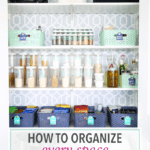 I am obsessed with bins and baskets and crates… basically anything that makes organizing cute. Cute labels don’t hurt either! 😉 I would love it if you linked this up on my blog for Crafty Chaos Tuesdays. Thanks for sharing. 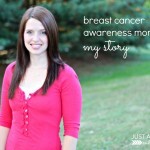 Love this idea, Abby! I have labels on my storage bins but I like that you can list what is actually in the bin. Thanks for sharing the printable. We’re about to experience the Christmas “bomb” effect this week, Lord willing. Thanks so much for the pretty labels, Abby! I’ll use them on my ebay storage bins also. 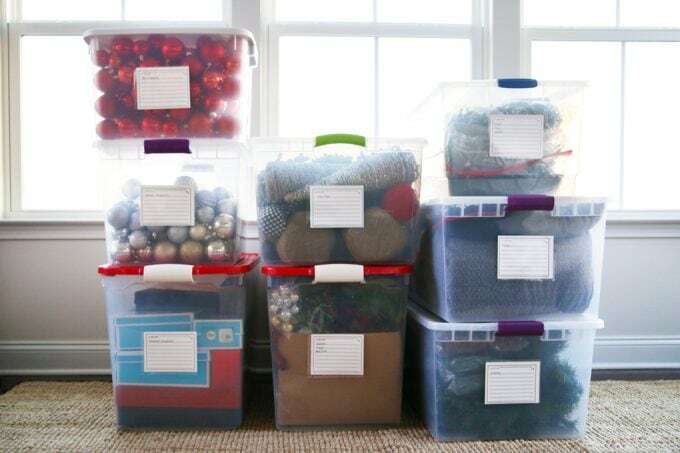 I actually organized my Christmas bins like this over 10 years ago, but I took my organization one step further. I numbered/named each bin and created a “library” of the contents. This library is kept in a 3-ring binder. I do this because my bins (over 13 of them) are stored behind the wall in my loft area and are hard to get to. I place the binder on the bin nearest the entrance. Doing this keeps me from having to read every label on every bin. You get the idea. I do a separate page for each bin. I also put the year in the upper right corner..If I discard anything I just mark through it. I also have a page titled Discarded that lists each year what I discard. This is a running. list. Why a discard page? So when I start looking for that oversized tree-shaped coffee mug that I just know I would never get rid of, I have a record of where it is. I also have a page titled Purchase or Make by Next Year and it is exactly what it says it is. This page also is a running list with the year. That is efficiency x 10! It would certainly clear up the mystery of “Where did my tiny silver tree go?” and remembering 3 days later it was given to a daughter the year before when Christmas cleanup began. Also, no need to find room to store the binder that would ineveitably get lost because it was put in a “safe place” that ever evolves and causes me too many headaches and is always in so safe a place I can never remember where when I need it! I do find it helps in January, to write on my new calendar what is needed for next Christmas ( finish pillows, but more tape,tags—-YOU DO NOT NEED MORE WRAPPING PAPER!) as a note for November 1. Then, when I’m tempted with all the new Christmas goodies for sale, I don’t curse myself that I have 40 rolls of paper and no tape or tags! My labels usually come off too easy (my OCD brain can’t stand to see the curled up corners of the labels)…What specific tape or adhesive do you use? Hi, Terry! I just used duct tape to attach these. When they are laminated, the duct tape has held up well for me. These are in our garage and aren’t messed with a lot. Have a wonderful week! After using the see thru bins and boxes for years and adhering labels to them, one day it occurred to me that I did not need the tape or adhesive. I now make those same labels, but now merely slide them down INSIDE the bin. It is visible, stays in place and if I ever decide to use that bin for something else, I do not have to deal with the removal and residual tape. Taking this storage process one step further, I like to take a photo of the contents before actually putting them inside (similar to your shot of everything in the living room. 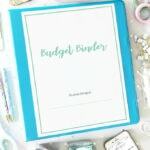 I like Kim’s idea of the binder and love your labels! Love these ideas! Thanks for sharing, Christine! I like this idea of slipping the label inside because, as much as I like laminating, it just adds more eventual plastic pollution to the environment. Good idea. 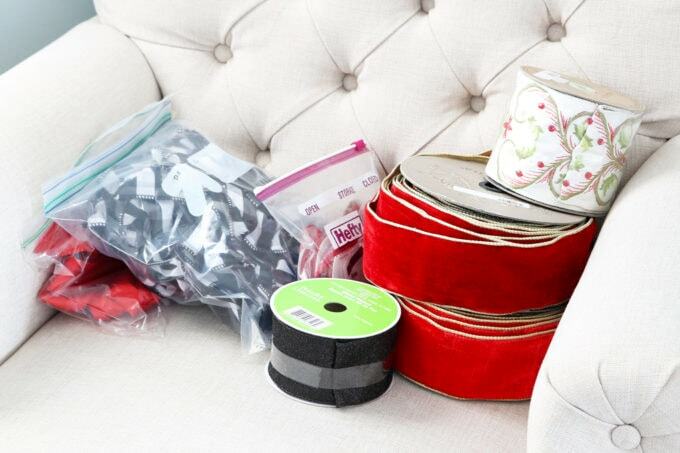 I also want to know the favorite for brand/type of storage bins. Of course I want quality at a bargain. I had picked up a bunch of clear bins and lids cheap and of course the lids don’t close securely! The printables are great! Thanks a lot! For a long time already I’ve been thinking to buy boxes and to organize my home! Thanks a lot! Greetings, Storage New Southgate Ltd. I finally did this when I retired and organized my garage! Mine is similar to Kim’s although I only print out the page that goes into a protector sheet – which gets placed on the end that is visible or on the top of the bin if it is a solid Xmas Red bin. I keep the original only on my computer. I collect Nativities, I have over 50, I also buy one ornament each year. Well 3 one for each of my two sons and one “family ornament”. All my bins are on the top row of shelves in my garage. I took the time to reorganization my Xmas bins this year too. Quite a task. I organized mine by room with another few bins for outdoor. lights. This year our calendar was so busy that I only had time to decorate the living room. I still had to go through so many bins to find what I needed, that I decided to reorganize my bins by room after Xmas. All of the bins are numbered and I keep a more comprehensive list of what is in each bin on an index card in my recipe file. It’s like a huge weight has been lifted off my shoulders. I am on the same page as your thought process only about 25 years ahead. Trust me when I say you are so going to be thankful in the future if you keep this up. The older you get the bigger your family gets and with age you inherit . Due to these things I have always had one box of: still love it but could live without it. 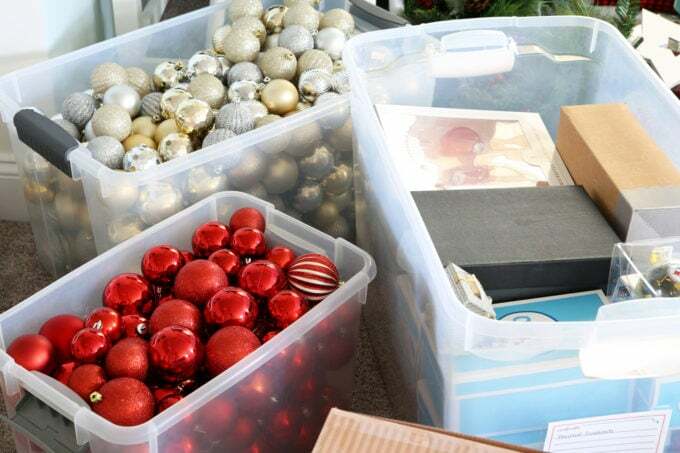 The stuff you are on the shelf about.sometimes the next holiday season your priority of things has changed and you may delegate some of those things elsewhere, when my kids were little all of their ornaments collected for each holiday were placed in their keepsake holiday boxes. As they have gotten older and their-boxes have expanded they are labeled: babies first Christmas – age 3 ornaments and or 1981 – 1984 Christmas and their names. I love your color coding ideas and lines for details. Thanks for the printable . What I don’t understand is: Why don’t you (and others) alphabetize? It makes looking for things sooooo much simpler. You only have to look so far and “nope” it’s not in this container… I also just put Christmas in certain containers and put them together so I know where Christmas is and then label them. Yay for organization! 🙂 Hope you have a wonderful weekend, Alix! Great system! 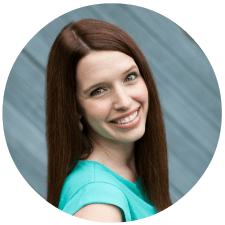 I’ve got to be more intentional about gathering everything first because it never fails that I find a snowman or a dishtowel a few days after everything has been stored. Thanks for the labels! Lol! It really is difficult to make sure you collect everything around the house! So glad the labels are helpful, Misty! Have a great week! 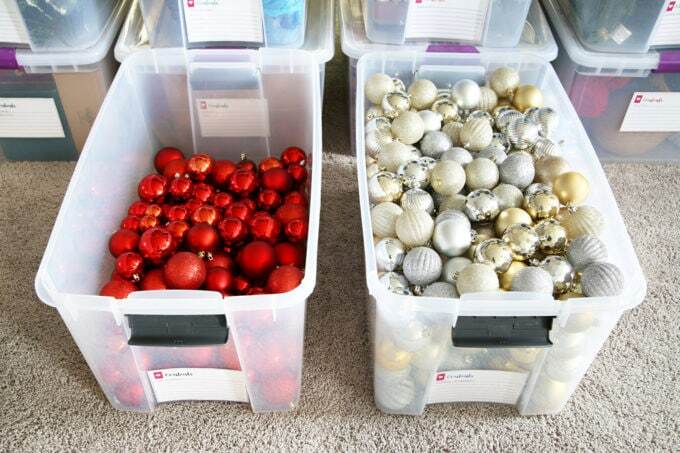 For something that’s used once a year for just a few days, Christmas decorations can really take up a lot of space. It is really important to purge and organize them. I like to have a limited number of storage bins and space dedicated to storing them. Once those bins are full, that’s it! Glad to see you got yours organized. So agree, Maria! Have a wonderful week! 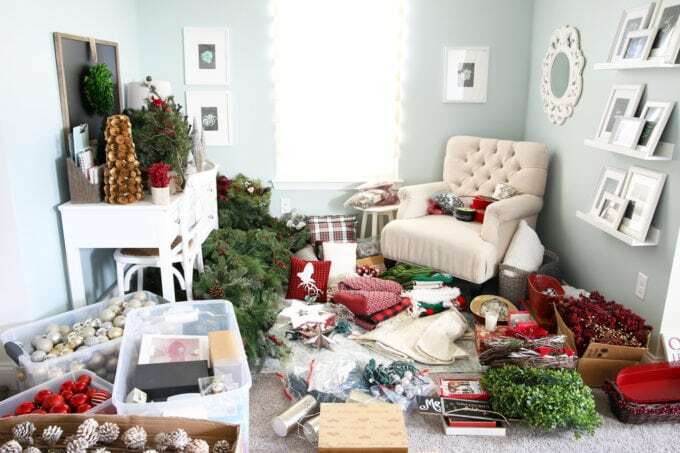 I do the same thing — Every year I take out my Christmas ornaments and decor and reprimand myself for not taking the time to organize them the year before! I definitely have to invest in some clear bins, though. Right now everything is in old paper boxes from where my mom used to work before she retired that she gave me when I moved. I know I have boxes in the attic I didn’t even pull out this year, too. Definitely time for a purge! 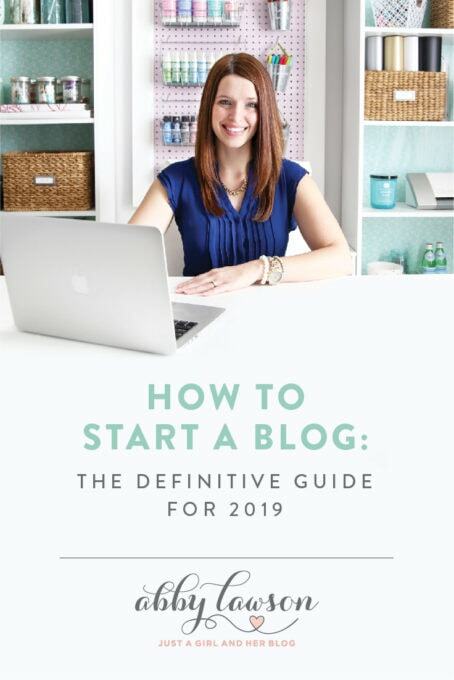 🙂 Thanks for another great post and Happy New Year, Abby! So glad it was helpful for you, Megan! Hope you’re having a wonderful start to 2017! I’m finally getting to those storage bins. I am a little late as usual. for the labels! I really needed something pretty! Abby-I did this a few years ago. Problem is that I store the bins in the attic. I sadly watch as the labels fall off them!. It might take a year but due to the surface of the plastic bins and the weather changing (?) the taped labels fall off. I didn’t even laminate the labels-I know plastic and laminated labels are hard to keep stuck together. Cant wait to get this done! Thoughts of my basement stress me all day long!!! Glad this will be helpful for you, Tami! 🙂 Hope you’re having an awesome week! 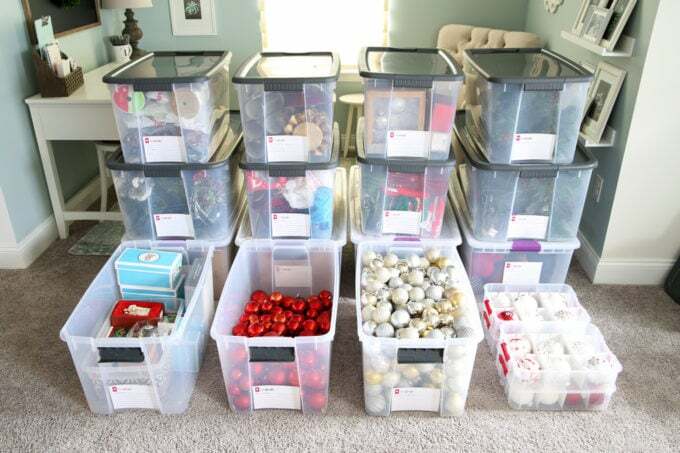 I typically use the clear plastic bins & organize by room for my Christmas things. This year was a time nightmare & I only put out about 1/2 of my decorations. I still have not tackled putting all away, but your suggestion for how to purge is an excellent one. Some things didn’t even come out this year so very likely they can move on. I have put the labels inside the box facing ou for years, (under the stairs,) but had not thought to laminate them. (I have a “forgotten” laminator for up to 11×17 sheets.) That will allow me to use a wax china marker or dry erase marker to add or delete notes each year! I think I only have two bins of Christmas decorations but they are full of Ziploc bags that are not organized. I like your idea of divided bins so ornaments can have their own place to stay. I found a few broken ornaments when I unloaded my ornaments this year so I need to make some adjustments when I put them away this year. Great suggestions! Thank you. This is going to be so much help as I get ready to pack and purge over 50 years of Christmas decorations. Love the ideas you have shared. I love getting your emails with organization tips! You are always so helpful! Thanks so much! 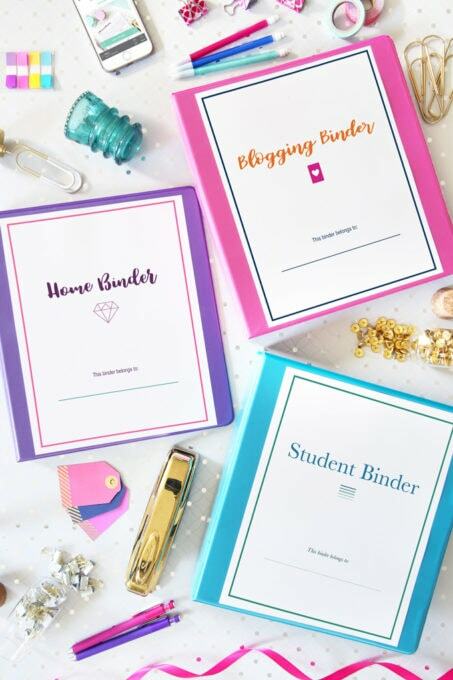 Here’s to an organized new year!! 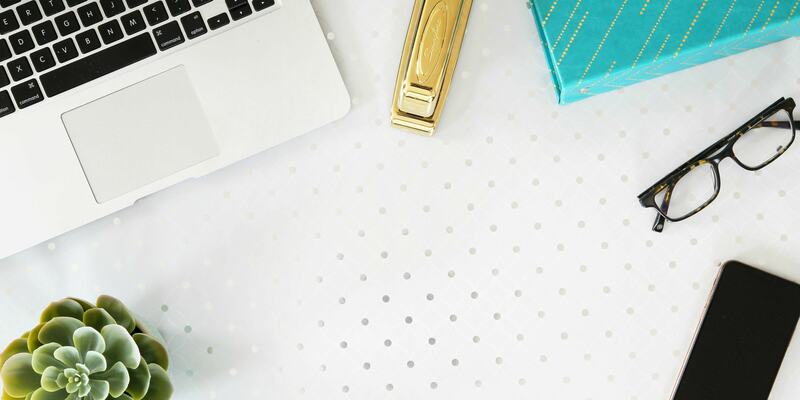 What kind of paper cutter are you using? You made it look so quick and easy! Love the laminated tags! I currently have the Recollections paper trimmer from Michael’s (http://www.michaels.com/recollections-signature-paper-trimmer/10202471.html#q=paper+trimmer&start=15), and I’ve also used a Cricut brand trimmer in the past– both worked great! Have a wonderful day! Abby, Your tips are really helping me in our move to our smaller retirement home. One question though, what kind of printer are you using for your labels and do you use the same printer for photos? Hi, Robin! I currently use this printer for labels and printables: https://www.amazon.com/gp/product/B01CJNMMZG/ref=oh_aui_search_detailpage?ie=UTF8&psc=1 . I typically have photos printed at a one hour photo place rather than printing them at home, so I haven’t used our printer for that. Hope you’re having a great weekend! Once I figure what I want to use to decorate, I very rarely change it. I organize my bins by room or surface. I buy modular bins so they stack well even though I have various sizes. I take a simple picture of the decoration and then place that in the box. 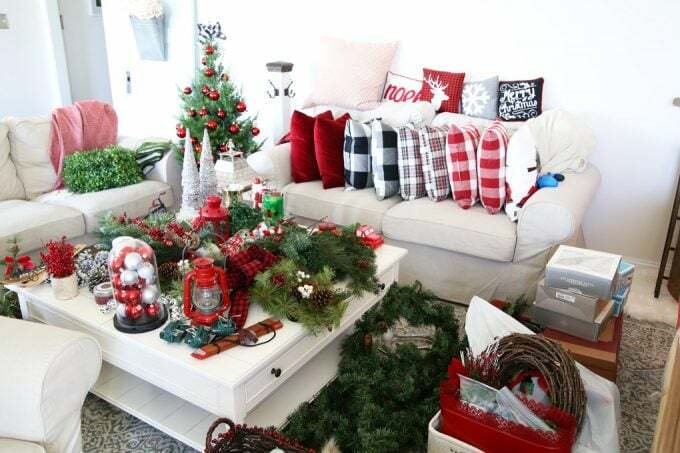 That way, if I have help decorating, it’s just a matter of taking the bin with the centerpiece I use on my coffee table and consulting the picture to know how to arrange it. 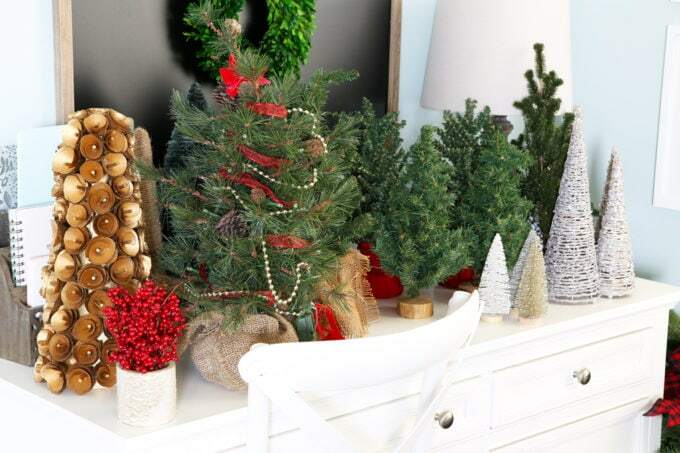 It allows me to decorate as I’m able, and doesn’t have to involve pulling out all bins. I also adhere my labels inside the box with packing tape. Wow! Love this system, Tonya! So organized!